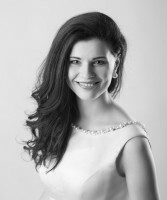 Aneta Ručková is young lyric-coloratura soprano from Czech republic. Aneta obtained her Master’s degree at The Janáček Academy of Music and Performing Arts in Brno. As an Erasmus student, Aneta spent a year at the The Karol Szymanowski Academy of Music in Katowice, Poland. During her studies in Brno, Aneta performed in the Chamber opera of JAMU the following roles: Vixen ‘Bystrouška’ in Janáček‘s opera The Cunning Little Vixen, Die Koloratursängerin in opera L´impresario in Angustie of Domenico Cimarosa and Studentus in opera of the F. X. Brixi - Erat unum Cantor bonus. Aneta participated in many international masterclasses and workshops, led by well-known opera singers, such as Olga Pasiecznik, Rainer Trost, Ewa Biegas, Stefania Donzelli, Michail Lanskoi, etc. In the season 2018/2019 Aneta makes her debut in the Oper Leipzig. Aneta performs the following roles: Frasquita (G. Bizet: Carmen), Kitchen boy (A. Dvořák: Rusalka), First noble orphan (R. Strauss: Rosenkavalier), Contessa Ceprano (G. Verdi: Rigoletto), Madeleine (L. Fall: Madame Pompadour), First child-spirit (W. A. Mozart: The Magic Flute) and others. As a member of the ensemble Oper Leipzig she took a part of Honk Kong Arts Festival in 2019. Aneta has already received many awards. She placed second and additionally received the Prize of Jury for her outstanding performance of Antonín Tučapský’s song cycle, Love and Sorrow, at an international contest Stonavská Barborka. She also placed second at a national folk contest called ‘Zpěváček’. Furthermore, she placed first at the song contest of Bohuslav Martinů in Prague and successfully competed at the international interpretive singing contest at The Janáček Conservatory in Ostrava. In July 2016, she sang the figure Idalba in the opera Ghirlanda di Fiori from Antonia Caldara at the famous baroque festival in Olomouc with Damian Ensemble. In 2017, Aneta sang the main figure Amaltea from the opera Il Natal di Giove from the componist Karel Müller. Aneta performs regularly all over the Europe in many International classic music festivals. Her repertoar is focus on opera, operetta, sacred music and classic songs. Aneta premiered Josef Javora’s symphony The Earth for 2 sopranos and orchestra with The Moravian Philharmonic Orchestra.